Studio of The Future is a Texcentric version of “Fresh Air”, driven by the insight, curiosity, and whimsy of Austin-based host Sara Hickman. Conversational and laid back, guests have included artists, musicians, authors, politicians, and a maestro — with more to come! 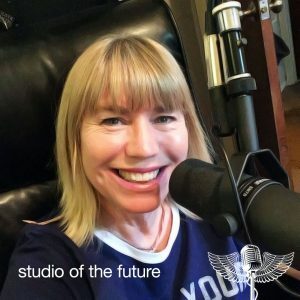 Sara Hickman is the producer and host of the podcast Studio of the Future. She is a musician, singer/songwriter, visual artist, and the State Musician of Texas (2010-2011), sandwiched between Willie Nelson and Lyle Lovett. She has performed twice on “The Tonight Show,” has been nominated for a Grammy, received an Honorary Degree from the National Association of Music Therapists, and you’ve heard her voice in commercials for Popeye’s, Daisy Sour Cream, Wal-Mart, Southwest Airlines, and many others. While State Musician, she oversaw the production of “The Best of Times,” in which 39 of her songs were performed by prominent Texas musicians (Willie Nelson, Shawn Colvin, Robert Earl Keen, Brave Combo, Marcia Ball, Ruthie Foster, etc) with all proceeds benefiting Creative Action, a non-profit that provides art and theatre collaborations in Central Texas schools. Her recordings have been used in TV and film, including “The Vampire Diaries,” “All My Children,” “American Idol,” and “Arachnophobia,” and she continues to receive humanitarian awards for her philanthropic endeavors. In Uganda, Sara teamed up with her dear friend, Lynne Dobson, to record an anniversary album with the African Children’s Choir and is currently involved in building a much needed fistula hospital for women and girls, the first of its kind for the country. Sara is currently concentrating on this podcast, producing/booking the MossFest Family annual concert series and creating visual art. She is mother to two freakin’ awesome daughters and has a very patient husband, who is a designer and photographer for their design company, Stingray. Learn more about Sara at sarahickman.com. Everywhere Audio is led by 30-year veteran audio-engineer, Marty Lester. Marty worked in both Los Angeles and Austin recording with talented artists such as Ani DiFranco, Alejandro Escovedo, Tracy Chapman, Iggy Pop, Dale Watson, and Sara Hickman. Since 1995, Marty has found his passion in audio post production and live recording and has been expanding into other areas such as podcasts and webcast production. 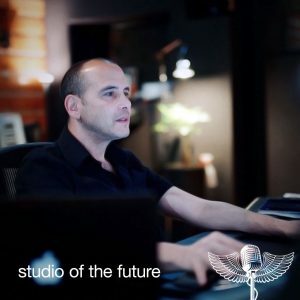 His clients have included KCRW, SXSW, as well as ADR/dialogue/music recording/editing and sound design for “Walking Dead,” “Futurama,” “The Simpsons,” Lollapalooza, and many other television, commercial jingle, and film projects. Connect with Everywhere Audio at www.everywhereaudio.com.